Ljubljana has one of Europe's most unique gastronomic scenes. Slovenia’s capital is rarely little more than a stopover on the road to the fairytale setting of nearby Lake Bled, but the quaint city of Ljubljana absolutely warrants a visit. In the city centre, pavement-pounding and pedal power are the preferred means of transport, and vibrant foliage tumbles into the emerald canal that snakes through the town. Add to that a cute castle and loads of green space and you’ve got yourself a rather pretty part of the world. Not only is Ljubljana incredibly beautiful, it has an equally unique gastronomic scene. Taking cues from Italy, Austria, Hungary and Croatia, Slovenian cuisine boasts a few unexpected hometown tricks. In Slovenia, local butchers pack their sausage skins with meat such as bear, wild boar and deer. The city’s colourful central market is the best place to track down samples of bear salami and the like, which you can bundle together in a picnic hamper to enjoy by the canal. If you want to visit the market under the guidance of a local who can point out all the deer-y goodness (plus the best of Slovenia’s other local produce – including 10,000 types of bread and cheese), join a tour with ex-food journalist Iva Gruden from Ljubljananjam for a comprehensive run-down. While gelato isn’t a technically a Slovene creation, Ljubljana does have one of the best ice-cream boutiques ever. At Gelateria Romanitka, chocolate, vanilla and strawberry scoops have been ditched in favour of experimental flavours like beer, rosemary and sea salt, pumpkin seed or masala chai. That’s just what happens when a former lawyer turns ice-cream extraordinaire – when Mateja Jerovšek gets behind the churning machine, it’s no holds barred. We’re all familiar with white and red wine, but what about orange? Slovenia is one of the original producers of this not-so-well-known tipple, which is made by fermenting whole white grapes, skins and all, to create an intense and unique taste. Expand your vinological horizons by sampling a glass or two at the cosy Movia wine bar in Ljubljana’s city hall building. Movia is one of Slovenia’s most well-regarded wine producers and their estate in the Goriška Brda region dates back to the 18th century. Suffice to say, they’ve had plenty of time to perfect their art. If there’s one thing Slovenia has nailed it’s the spiralled doughy goodness that is štruklji. The sweet or savoury pastry is commonly found across the country, but you’ll feel damn chuffed if you devour one you’ve made yourself. Sign up for a class with Špela Vodovc from Cook Eat Slovenia and learn to stretch the thin blankets of dough just the right way. Your warm štruk-mastery signs off a generous four-course meal, supplemented by delish Slovenian wine and homemade liqueurs. The sweet but not-too-sweet bread, potica, is a typical Slovenian food commonly associated with special occasions. Walnuts are commonly used as a filling, but you can also find potica made with chocolate, plum, and tarragon ­(a herb Slovenians are rather fond of in desserts). And while it looks simple enough, it takes serious skill to create. Le Potica has perfected the technique and specialises in creating cute mini poticas. They’re ideal for the curious culinary traveller keen to sample a variety of flavours. They also save lugging an entire cake in your backpack – because nobody likes crumbs in their passport. The idea of hoeing into a horse steak might seem confronting but, sometimes, travelling is about challenging the concept of normal. While it’s not considered everyday food for most Slovenians (in the same way most Aussies don’t keep a bank of croc steaks in the freezer), horse meat is reasonably easy to find. Hot Horse is the city’s best-known establishment for such fare, having built a reputation around enormous horse burgers doled out in three locations across the city. 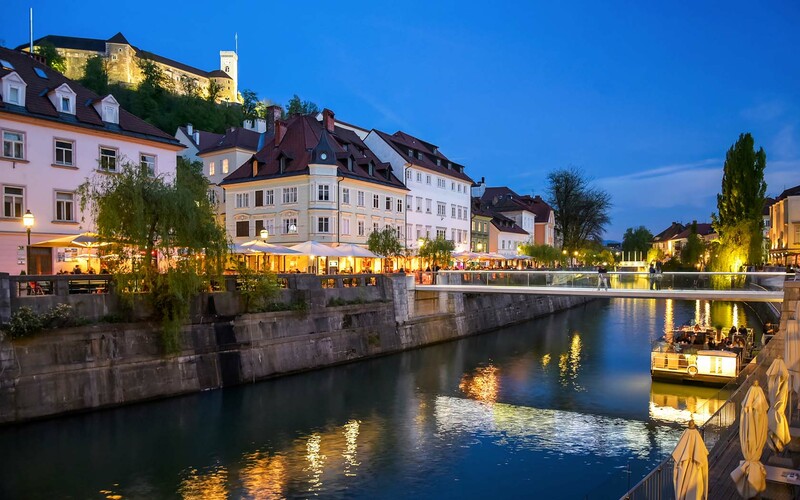 Check out Qantas flights to Ljubljana.